Wireless Trackball M570 stays in one place so you don't have to move your arm to move your cursor. The sculpted shape supports your hand and lets you rest your arm. Scroll wheel moves up and down through Web pages and long documents. Design also features programmable buttons, back/forward buttons, and an adjustable laser sensor for a wide range of cursor speeds. Advanced 2.4 GHz wireless delivers reliable performance, effectively eliminating delays and dropouts (compared to conventional 2.4 GHz and 27 MHz wireless technologies). Trackball is automatically paired with the receiver plugged into your computer and minimizes conflicts with other devices. Control devices up to 30' away. The included Logitech Unifying receiver is a tiny, wireless receiver that stays in your laptop and lets you add up to six compatible devices. Battery life lasts 18 months. 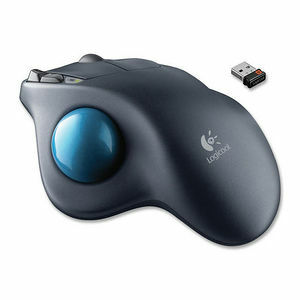 Trackball includes the required single AA battery and is compatible with a USB port, Windows XP, Vista, 7, Mac OS X 10.5 or later.